The CGM iPro sensor I wore for five days (see post below) came off Monday morning in a hurricane. Not exactly what you think, but I like the drama. My walk from the subway station to the hospital to see my CDE was in a rainstorm at high gale winds we rarely see here in New York – umbrellas discarded on the streets, puddles knee-high. Were it not for the fact that my iPro site was itching like mad for two nights from the sticky tape over it I’m not sure I would have braved the storm at all. By the time I arrived at the hospital the entire front of my jeans was soaked so that I was wringing water out of the cuffs. I was eternally grateful that not only did I brave the storm, but that my CDE did as well. Moments later the CGM came off, a lot more easily than it went in thank goodness, and we downloaded the results. Luckily the battery lasted for as long as I wore it, just over five days. That’s not always the case, but it was here. Hallelujah! Then we stared at pages of graphs, charts and numbers of my blood sugar numbers as picked up by the sensor every five minutes and I got to see my patterns throughout the day, and night. Since I was doing finger sticks at least four times a day along with wearing the sensor, my daytime numbers were not surprising, and, my daytime numbers are typically understandable to me. When I’m a little high it’s usually because I didn’t calculate the carbs in a meal or snack correctly. When I’m a little low it’s usually for the same reason, or my powerwalk lowered me slightly more than I expected. Being insulin-sensitive, as many type 1s are, a half unit of my rapid-acting insulin has an impact. During this five day period I also went high after a birthday lunch for my mom who turned 80 – a poor calculation on the calamari and spring rolls! But mom, you’re worth it. And I discovered just as routine is my savior, so is my experience. Since I was logging my numbers, I used the carb counts on packages more than usual and that led me more astray than the educated guesses I typically make based on years of testing. Perhaps it’s because food manufacturers are allowed a 20% margin on the carb counts listed on their packages, so beware. But what I really wanted to know from this experiment is what my numbers do overnight, and that was the reveal. Around midnight they start sliding downward hour after hour. Around 5 AM they are at their lowest, in the high 50’s/low 60’s, and then they begin to gradually come up between 5:30 and 6:30 AM and then rise more swiftly. If I wake up and test my blood sugar around 6:30 AM the number’s usually around 75 or 80, a half hour later they’re 90 or 100. A half hour after that they’re climbing over 100. This is without doing anything or eating anything. “This is perfectly normal,” said my CDE and nothing to worry about. In the morning your liver is pumping out glucose-raising hormones to get you ready for the day (dawn phenomenon). Even if you’re a little over 100 before you take your injection, it’s fine.” O.K., I’m relieved about that since my boundaries are admittedly narrow. So what I know is I’m working the MDI (multiple daily injections) system as best I can. I keep my blood sugar between 120 and 140 before I go to sleep, on the higher end of that range if I’ve had wine with dinner since that creates a slightly greater drop overnight. Then I blunt the morning rise with one unit of my rapid-acting insulin as soon as I wake up and take the rest of my breakfast dose just before or during my morning meal. My concern that I drop so low overnight, like to 30 or 40 mg/dl, that my liver shoots out glucagon to save me from dying turned out to be false. That is a relief. Also, while I don’t log my numbers ordinarily, I’m already obsessive enough, if you log your numbers – and for most people this is an invaluable exercise – make sure you also note what you eat and any exercise. Most log books don’t give you space for this. So log your numbers on a simple sheet of paper. A bunch of numbers without these references is an incomplete picture. I highly recommend if you have access to wearing a trial CGM for a few days to see your pattern that you do so. This kind of information can lead to an important change or modification in your treatment plan. I know I’ll be sleeping better from now on. Note: Our bodies are different. Don’t base any of your own treatment decisions on my results. Check with your health care provider to be safe. 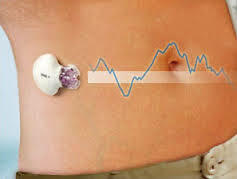 Noticing I was becoming a sugar-testing junkie recently, I opted to get hooked up to a CGM for a 5 day trial period, save some finger skin and see if I could learn something. My recent addiction to knowing where my numbers are, beside a proclivity to perfection, is largely because my blood sugars rise sooo rapidly in the morning. Can I shut the barn door more quickly so I don’t have to do two boluses before breakfast? The first to merely blunt the rise. When I left my CDE’s office, newly bionic, I walked about 20 blocks to meet a friend for lunch. Each footfall, I was overly aware of this gizmo dug into my side and the very fact that my walking was impacting my blood sugar. A weird thing for your brain to be so focused on an automatic body function. When I sat down to lunch I copped the banquette seat feeling vulnerable and exposed to any passer by who might ram into my poor abdomen. Well, it’s not really on my abdomen, but I don’t know what you’d call this side area. Leaving the restaurant I began to experience my plastic gizmo differently. I felt somehow as though it was now my helpmate. As though I was not in this all alone anymore. I found this quite comforting and recognized it as a wholly new feeling. Now, two days in, I’m used to my CGM, it doesn’t hurt but the five inches of sticky tape that’s holding it in place grips and pulls as I twist and turn. And while my plastic companion is (hopefully) tracking my numbers, so am I four times a day in a log book, along with carb counts and activities, just in case anything goes awry. I will keep you posted next week when gizmo comes off. It would be dandy to have learned something more than which pants slide easily over gizmo and which ones don’t. Remember that popular Beatles’ song, “When I’m 64?” The refrain goes, “Will you still need me, will you still feed me, when I’m 64?” I often wonder how I’ll be able to manage my diabetes when I’m old. Granted I’m 56 and many would say I’m already old, but let’s not go there. But ’tis true, my memory isn’t what it used to be. Sometimes in the morning, since I take three injections, I can lose sight of which I’ve taken and which I haven’t. I begin with an initial unit of Apidra (rapid-acting insulin) when I first wake up to blunt my rising blood sugar (dawn phenomena). I take my breakfast bolus once my bowl of oatmeal is already in my lap – sorry, small one bedroom apartment means my dining table supports my computer, not my meals. I try to take my Lantus (long-acting insulin) around 8:30 AM, but sometimes I’m just not entirely sure whether Lantus made it into the mix, in-between the testing my blood sugar, throwing the oats in the pot, stirring, checking the weather, sifting through my new emails, deciding what to where and when to shower. The way I can usually remember whether I took my Lantus is to try and find the red mark on my body where I injected. Is it on my thigh, near my navel, on my upper arm? If I can remember where I injected, then I know whether I’ve injected. Hmmm…doesn’t inspire great confidence, does it? What will happen as my eyesight worsens? I’ve worn glasses since the age of eleven, but what if it gets worse? Will I be able to see the notches on the syringe? True, by then I’ll be bionic sporting a pump, CGM, artificial pancreas, the whole nine yards, and likely the cataract surgery I’ll need soon may even restore my eyesight. OK, forget that one. But what about Alzheimer’s? How do people with Alzheimer’s and diabetes remember to take their medicine? Order their refills? Schedule doctor visits? How do people with Parkinson’s and diabetes keep from trembling during an injection or pump bolus? Really, how? Managing diabetes as a fairly healthy adult who works at home and so can tailor her day around her diabetes needs is laborious, but entirely doable. What will it be like, however, in ten or twenty years when my knees are shot so I can’t stand well and reach my insulin in the fridge, my memory’s gone so I haven’t a clue if I shot up or even what I take anymore, the dribbling starts and I slip in the tub…yikes! All this makes me ruminate that this is not an illness for the aged and yet of course it’s mostly seniors who get diabetes. I don’t know the answers to how I’ll manage this when I’m 84 (at least I’m thinking that far out) so I choose not to spend much time in the question. And I do expect by time I’m “old” so much will have changed to manage diabetes that there’ll be hardly much at all to do. Doesn’t hurt to dream, does it? The recent earthquake in Haiti reminds us that when danger strikes, people with diabetes are doubly hit – not being able to do without their medicine and testing supplies. Insulin for Life is sending insulin, strips, meters, lancets, pens, pen needles and syringes to Haiti and can use your donation. Their operation will need funds to be able to continue sending supplies. You’ll see a ‘Donate’ button on the left bar of their web site in orange. You can also check out Manny Hernandez’ post about his exchange with Insulin for Life’s president Ron Raab. 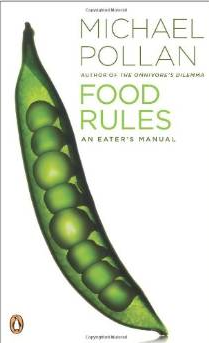 From time to time I see a book worth mentioning and my latest little thrill is Michael Pollan’s, “Food Rules.” Pollan, author of Omnivore’s Dilemma, seems poised to be another Michael Moore, aiming his sword at our food giants’ factory floors and over populated animal pens. The American food system, according to Pollan, sets us up for obesity and ill health as 90% of what’s in our supermarkets and is easily accessible, affordable and available isn’t real food but food-like substances. Chemicals mess with our metabolism and overly sweet and salty foods leave us craving more of the same. I happen to agree with him wholeheartedly. After spending years trying to answer the supposedly incredibly complicated question of how we should eat in order to be maximally healthy, Pollan discovered the answer was shockingly simple: eat real food, not too much of it, and more plants than meat. Or, put another way, get off the modern western diet, with its abundance of processed food, refined grains and sugars, and its sore lack of vegetables, whole grains and fruit. Again, he gets my thumbs up. This is, by the way, how I’ve been eating the last several years and maintaining both my weight and my A1Cs in the 5’s. “Food Rules” weaves humor and real life practicality into simple, straightforward rules for making healthy food choices. You can read it in an hour and be a lifetime wiser. As this new year begins I have not made any New Year’s resolutions. Actually I never do. Not since turning old enough to realize they’re a cruel joke we play on ourselves. If I don’t keep them I’ll feel like a failure and if there’s something I really want to do, I’ll do it. One thing I have been doing these past few weeks, however, is re-reading the slew of posts that I’ve now written here over the last two years. Truth be told, I would barely change a word. What a nice feeling that’s been, and so has re-reading my own lessons been, which, yes, I benefit from as well as anyone. Here’s one that struck my fancy again especially because it reminds me to look for the good and believe in myself especially starting a new year. What if we had to purchase happiness and self esteem the way we purchase most things? Would you value it more? Would you feel it more? Would you recognize it as a tangible commodity you owned? Would our lives be happier, easier, more joyful overall? It’s an interesting notion I think. Somehow it seems negative emotions: anger, fear, guilt, worry get more of our attention and feel more at home in our lives than positive emotions like happiness, hope, pride and success. Is it just fear of failure or something else at work? I don’t know, but if you had to pay for simple pleasures – a sunny day and a clear blue sky, a field of flowers, to have the loved ones in your life that you do, the satisfaction of a job well done, a fun dinner with friends, coming home after an arduous trip, having your kids put an arm around you – would you enjoy these things more? I try these days, as too many of my contemporaries are getting ill and passing away, to recognize how fortunate I am and cherish the day and all it brings. Time passes much faster than it used to so I’m trying more and more to follow the words of a very wise man, “Be the change you want to see in the world.” These were Ghandi’s words. So, if you want to have love, be love. If you want to enjoy peace, be peace. If you want to find joy, be joy. If you want to see yourself live well with diabetes, live well with diabetes. And I think the way to appreciating things more is while not necessarily easy, pretty much as simple as what Christopher Robin said to Pooh: “You must remember this: You’re braver than you believe, and stronger than you seem, and smarter than you think.” Hmmm…that’s a lot to take in, and yet, some pretty good stuff to live by. So as I start this new year and it stretches in front of me now pretty much a blank canvas, I’m going to try and remember my own words and those of Christopher Robin. After all, one of my true blessings is the company I keep – around the corner, virtually and in storybook form.